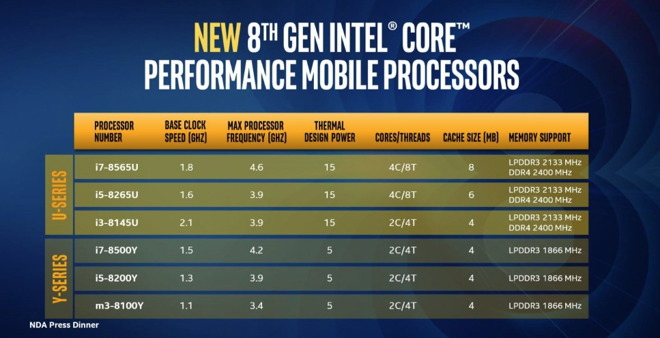 Intel has revealed a collection of six U-series and Y-series processors in its 8th-generation lineup, with the group of notebook-oriented processors touting low operating temperatures and Gigabit Wi-Fi speeds, making them good candidates for use in a future MacBook or MacBook Air. Unveiled at IFA 2018, the six chips are split between the U-series "Whiskey Lake" chips and Y-series "Amber Lake" families, with the former aimed at mid-range notebooks, while the latter is meant for ultra light-weight notebooks and tablets. The U-series is headed up by the quad-core i7-8565U, which has a base clock of 1.8GHz rising to 4.6GHz under boost, and an 8-megabyte cache. It is joined by the quad-core i5-8265U clocked at 1.6GHz unboosted and 3.9GHz boosted, with 6 megabytes of cache, and the i3-8145U, a dual-core processor with a base clock of 2.1GHz, 3.9GHz boosted, and a 4-megabyte cache. These three processors have integrated Gigabit Wi-Fi support, allowing them to connect at high speeds to supported local AC wireless networks. The chips also include support for Dolby Vision HDR and Dolby Atmos audio, and are claimed to be so power efficient that a notebook using them could last for up to 16 hours on a single charge, or up to 19 hours on a power-optimized system. Intel has also included a new audio DSP, which can allow the U-series processors to work with digital assistants properly, including Cortana and Alexa. The Y-series chips include the i7-8500 and i5-8200Y dual-core processors, with each offering 1.5GHz and 1.3GHz base clock speeds, and 4.2GHz and 3.9GHz maximum clock speeds respectively. Lastly, the m3-8100Y has a base clock of 1.1GHz that can boost to 3.4GHz. While the Y-series chips do not have as many of the new features as the U-series, they do retain the Intel Wireless-AC support for Gigabit Wi-Fi speeds, along with eSIM support when used with Intel's Gigabit LTE modems. All of the processors run quite cool, with the U-series said to have a Thermal Design Power of 15 watts, while the Y-series is set at 5 watts. These make both ranges extremely attractive to notebook vendors, with the Y-series believed to enable thin and light designs less than 7 millimeters thick. Neither of the two series would be real candidates for use in the MacBook Pro line, partly due to the lack of LPDDR4 support that would allow Apple to use the lower-powered memory instead of DDR4 memory. The low TDP and the audio DSP used in the U-series has the potential to be used in a MacBook or MacBook Air refresh, though it would require Intel to keep to its production schedules rather than delaying the release of the chips. Intel claims notebooks and 2-in-1s using the new U-series and Y-series processors will be available starting this fall.